Thanks to its intricate design, it is possible for the Safescan 1250 to count both the old and the new £1 coin in a fast and secure manner. With a roomy hopper that can hold 500 coins and a counting speed of 220 coins per minute, the Safescan 1250 will have your cash drawer counted in a flash. Simply pour all the coins from your till or bag into the hopper—no need to sort them in advance—and press start. With a roomy hopper that can hold 500 coins and a counting speed of 220 coins per minute, the Safescan 1250 will have your cash drawer counted in a flash. Simply pour all the coins from your till or bag into the hopper, no need to sort them in advance and press start. Let the 1250 help you optimise your cash-counting workflow. Simply press “batch” and enter the desired number for each coin denomination, then press start. 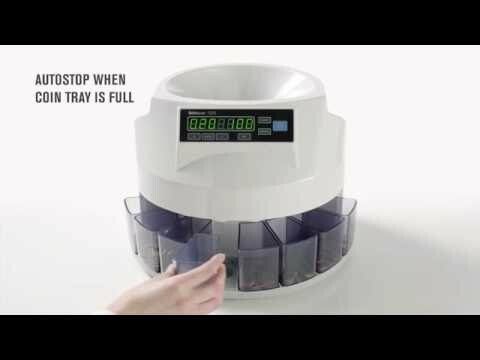 The 1250 counter will automatically pause each time a coin cup reaches the programmed amount. There’s no faster way to prepare your coin rolls, bank deposits and cash drawers. To make your administrative task even easier, the 1250 counter can automatically print your complete results to the optional Safescan TP-230 thermal printer. The Safescan TP-230 is fast: it will print your full results in crisp, clear text in less than a minute. And thanks to its modern thermal print technology, the TP-230 is lightweight, compact and nearly silent. For maximum convenience, the TP-230 uses standard, widely available thermal printing paper and comes with both USB and serial printer cables (and a paper roll to get you started). Simply plug the sturdy, compact Safescan TP-230 into your 6155, 6165, 6185, 1250, 2665-S, 2685-S or 2985-SX money counter and automatically print a detailed report on each denomination and the total sum counted. The ideal way to print hard copies for your records or fill out your daily cash report.